Code 2 of 5 Barcode Creator Add-on of RasterEdge DocImage SDK for .NET is a fully-functional barcode generating control DLL. It can be easily integrated into C#.NET imaging projects such as C# class library, ASP.NET web projects and windows applications. To use this library, the minimum requirement is the installation of MS Visual Studio 2005 or later. Besides this C# barcode generation guide, we also provide developers with VB.NET Code 2 of 5 Barcode Drawing Tutorial. You can easily generator Code 2 of 5 barcode and save it to image files/object using this C#.NET barcode generator control. 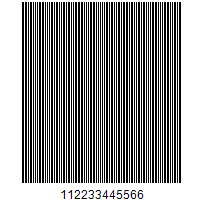 The following steps will show how to create a Code 2 of 5 type barcode encoding numeric data text "112233445566" into the image object with XImage.Barcode.Creator. Please copy the sample code as follow to generator a Code 2 of 5 barcode. This C#.NET library add-in is designed to help developers create, draw Code 2 of 5 bar codes on various image files. Supported image formats include png, gif, jpeg, and bmp. The sample code below is taking the png image format for Code 25 generation as an example. Copy and paste it to your C#.NET image program for a test and make necessary adjustment on the C# code to create custom Code 2 of 5 image. You can view detailed settings in the property table below. Apart from the image processing project, this C#.NET barcode generator add-on can be also used in those document managing & manipulating projects. Using this .NET Code 2 of 5 barcode creator add-on, you can easily generate & insert Code 2 of 5 barcode on PDF, TIFF, Word, Excel and PowerPoint documents. From the following C# code, you will see how to generate a customized Code 2 of 5 barcode on a png image file in .NET class application. All the properties listed above are demonstrated, please make any modification if necessary.